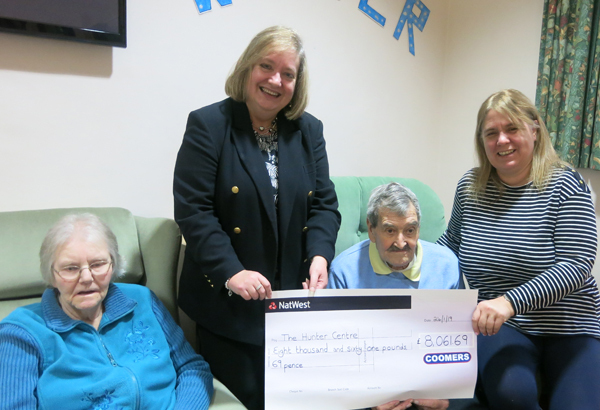 Our 2018 charity of the year was The Hunter Centre, and we were delighted to visit their excellent day care centre at Haslemere and present them with £8,061.69 on 24 January 2019. This was a record fundraising amount for our charity of the year and we'd like to sincerely thank all our customers for their generous donations, which have made all of this possible. The Hunter Centre operates from the Marjorie Gray Hall on Grayswood Road in Haslemere, providing day care and stimulation for those living with various forms of dementia - whilst also giving support and advice to carers - in a relaxed, friendly and secure environment. For more information about The Hunter Centre, please contact Elaine Clement, Operations Manager, on 01428 654710, or check out their website. You can also find The Hunter Centre - Haslemere on Facebook.